Vishnu is, with Shiva, one of the two most important gods in later Hinduism. He is regarded as sustainer of the universe and maintainer of order. Assuming various forms (avatars), he restores the balance of good and evil in the world. In Indian art, the lotus (nymphea pubescens and nymphea stellata) is by far the most frequently represented of all the rich flora of the sub-continent. Flower, petal, seed-pod, bud or leaf are omnipresent from earliest times: they serve as emblems, stands, seats or thrones, as well as petalled mouldings. Yet, as is often the case in India, it is difficult to define the symbolism of the lotus in a single formula. The lotus’s rise from the waters (and mud), spotless and unwettable, into the realm of air and light, is consonant with much aquatic and cosmological symbolism, including creation myths [see EA1969.43]. The lotus is also equated with spiritual insight (bodhi) residing in the heart (hṛdaya). Like the heart it expands in the light of knowledge or devotion. According to Tantric interpretation (a relatively late and esoteric manifestation of Indian religion, with a highly mystical and even magical metaphysic), an image of the deity in a lotus, i.e. the heart, indicates the supreme self-identification of the individual consciousness with God. 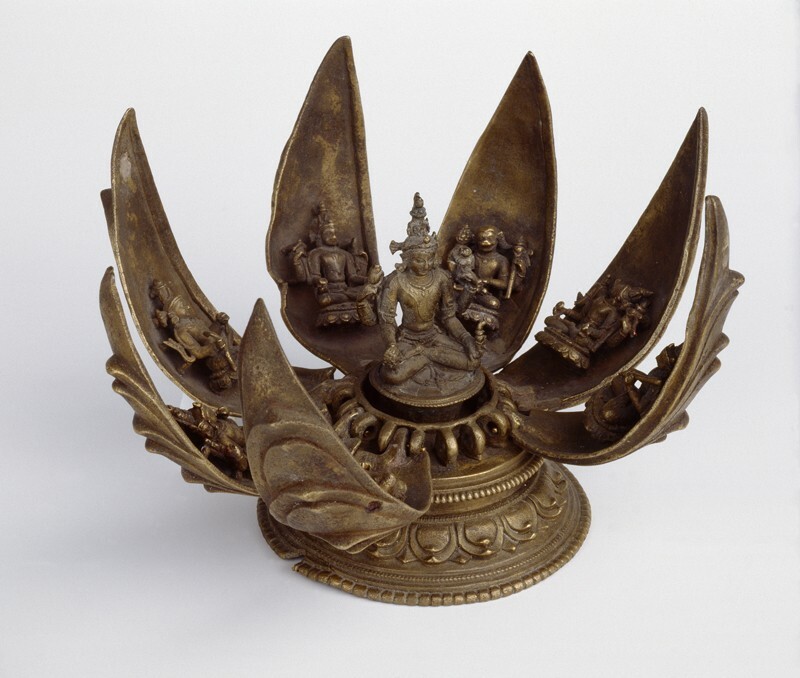 The petals of this bronze sculpture are hinged, thus permitting the lotus to open and close. Inside sits a four-armed Viṣṇu in padmāsana, on what one authority has called the seed-pod of the lotus. He holds a lotus in his right upper hand, a conch in the left and a sweet lime (or mātuluṅga) in his left front hand; the object in his front right hand cannot be identified. Of eight petals, seven have survived. On their insides, separately cast, are attached little figures of incarnations (avatāras) of Viṣṇu. 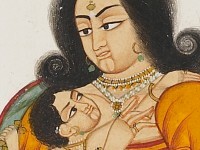 Some, like Varāha, Narasiṁha and Bālarāma, belong to the standard group of eight. Others, including probably Dattatreya, are difficult to identify. They are in most cases two-armed and hold a single symbol, a bow, an arrow or flute, or a club. They may represent major incarnations (e.g. Rāmacandra or Kṛṣṇa) or else perhaps minor ones, of which there are a great number. A number of bronze lotuses of eastern Indian origin are known, usually on stems and with similarly movable petals. The central figure, instead of Viṣṇu, is usually a divinity of the Buddhist Mahāyāna or even the Tantric pantheon. Such an ambiance may account for the avatāras of the Museum’s lotus not corresponding to the usual representations of the group. The are Newāri numberings on the base and the petals, suggesting a Nepali origin for this piece which is particularly notable for the fineness of its casting.